Have you ever wondered what to do with fresh turmeric root, that finger-sized edible rhizome of the Curcuma longa plant? Turns out, turmeric root is surprisingly versatile: it can be used to add yellow color or orange and mild flavor to a broad range of dishes including smoothies, soups, rice dishes, omelettes, and more. Below, you find our top ten ideas on how to use fresh turmeric in cooking. 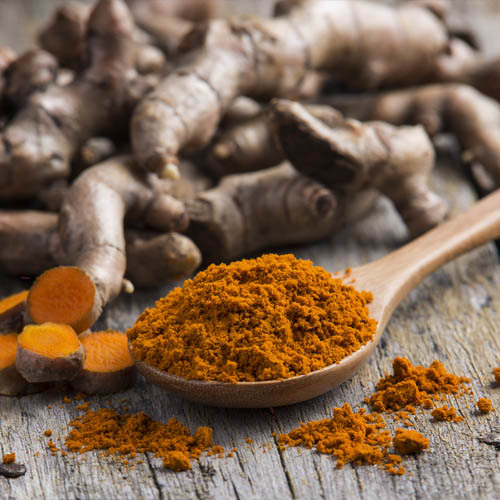 Note: Be careful when using fresh turmeric root in your culinary creations – it can stain your hands, cooking utensils, and clothes, even more than turmeric powder! A little bit of peeled and grated fresh turmeric root can make a healthy smoothie even healthier, plus the natural pigments in fresh turmeric help intensify the color of orange and yellow smoothies. To make a turmeric-enriched smoothie, simply add a teaspoon or two of peeled and grated turmeric into your favorite smoothie. Both the color and flavor of fresh turmeric make this golden-colored rhizome a particularly good addition to mango smoothies. Crush the peppercorns, cardamom seeds, and cloves with a mortar and pestle. Peel and chop the turmeric root and ginger. In a small pan, heat the milk along with the spices for 2-3 minutes. Let the mixture cool until it’s warm, then drain it into a cup. Add honey to taste. Drink immediately. If you have a recipe that uses mustard or saffron to give the dish a yellow(ish) hue but don’t have any mustard or saffron on hand, try using a small amount of peeled and grated fresh turmeric as a substitute. Turmeric is called “poor man’s saffron” for a reason! Some people use fresh turmeric juice, made by squeezing peeled turmeric root in a garlic press, to give boiled or steam-cooked rice a beautiful golden color. However, this use for turmeric is only recommended for those who like the unique flavor of fresh turmeric as the turmeric flavor is relatively prominent against the mild flavor of rice. If you’re running out of ideas for what to do with all that leftover turmeric root in your fridge, consider dehydrating sliced turmeric root in a food dehydrator. You can then grind the dehydrated slices to make your own turmeric powder. Or, store them whole in an airtight container and steep them in hot water whenever you feel like having a cup of turmeric tea. You can also use fresh turmeric to add color and flavor to omelettes or scrambled eggs. Simply add some grated turmeric (or freshly squeezed turmeric juice) to the egg mixture before cooking it on a frying pan. Turmeric is a key ingredient in curry paste, a concentrated blend of spices used as a cooking ingredient in the preparation of a curry. Most recipes for homemade curry paste call for dried turmeric powder, but you can also use fresh turmeric if you like (substitute one 1/2-inch piece of fresh turmeric for every teaspoon of ground turmeric). Mix all ingredients together in a bowl. Add the chicken and massage marinade into the poultry until evenly coated. Seal the bowl with a tight-fitting lid and place it in the refrigerator. Let the chicken marinate at least 2 hours. Using chopped fresh turmeric root is a great way to add color (and mild flavor) to white and yellow pureed soups, such as carrot soup, cauliflower soup, and yellow pea soup. The flavor of fresh turmeric pairs well ginger, so look for soup recipes that also call for fresh ginger. Chopped fresh turmeric can also be used to add color to coleslaw. Slaw featuring red or white cabbage and turmeric also makes an excellent cancer-preventing dish as both cabbage and turmeric contain phytochemicals with proven anti-cancer effects. For maximum health benefits, dress your coleslaw with buttermilk or a vinegar-based dressing, rather than mayonnaise. Next Next post: Pink Himalayan Salt: Does It Have Any Health Benefits?